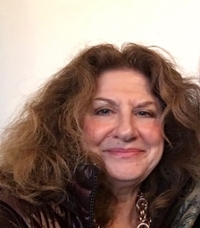 Donatella Stocchi-Perucchio (Laurea, Foreign Languages and Literatures, University of Florence, Italy; PhD, Italian, Cornell University) is Associate Professor of Italian in the Department of Modern Languages and Cultures at the University of Rochester. Her major research areas are Dante Studies, modern Italian literature and culture, and the Ventennio, with attention to the dialogue between literature, history, and the arts. She has published on Dante, Cavalcanti, Pirandello, and Leopardi. Her current research branches in three main directions: Dante's political philosophy in the context of the juridical literature of the thirteenth and fourteenth centuries; the political reception of Dante—in particular, the case of Giovanni Gentile and the notion of the "Ethical State"; and the phenomenon of Dante's reception across media, genres, and cultures. She is currently working on the creation of a digital archive for the iconography of Dante's Divine Comedy. Other interests include the digital humanities as a new avenue for the study of literature in connection with the visual arts and the production of documentary film as an interpretive idiom to address literary and cultural phenomena. She collaborates on the interdepartmental minor in Medieval Studies and on the interdisciplinary major in Archaeology, Technology, and Historical Structures at the University of Rochester. She is the founder and academic director of the University of Rochester Semester Program in Italian Studies in Arezzo, Italy. The program is fully integrated with Italian Studies on campus and provides a comprehensive and academically sound interdisciplinary introduction to Italian language and culture, with special focus on the Middle Ages and on Roman antiquities from archaeological, architectural, and historical perspectives. She is also involved in various collaborative endeavors with the Department of the Humanities at the University of the Pacific in Lima, Perú. She coordinates a "Distinguished Italian Visiting Scholar Program," and serves as a liaison with the University of Siena, Arezzo, supporting collaborative faculty research and exchange. She is a frequent contributor to the activities and publications of the Petrarchan Academy in Arezzo, Italy. Dante Politico: Ideological Reception Across Boundaries, eds. Dennis Looney and Donatella Stocchi-Perucchio. Mediaevalia 38, 2017. “Dante politico: Towards a Mapping of Dante’s Political Thought.” In Dante Politico: Ideological Reception Across Boundaries, eds. Dennis Looney and Donatella Stocchi-Perucchio. Mediaevalia 38 (2017) 13-36. 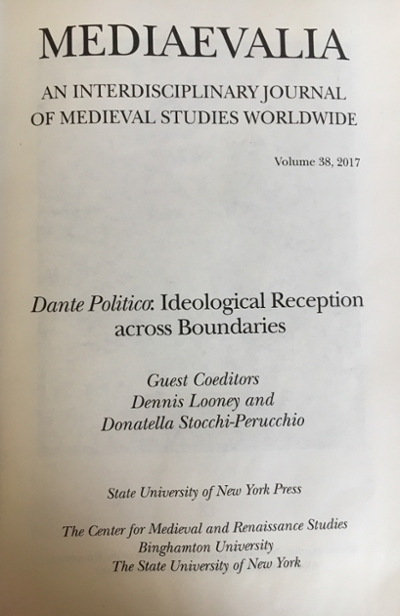 “Giovanni Gentile’s Reading of Dante as Prophet of the State in interiore homine.” In Dante Politico: Ideological Reception Across Boundaries, eds. Dennis Looney and Donatella Stocchi-Perucchio. Mediaevalia 38 (2017), 169-208. “‘Tu l’hai fatto di poco minore che li angeli’: Nobility, Imperial Majesty, and the optimus finis in Convivio IV and Monarchia.” In Il Convivio or How to Restart Writing in Exile, ed. Franziska Meier. Leeds Dante Series. Oxford: Peter Lang, 2018, 1-32. 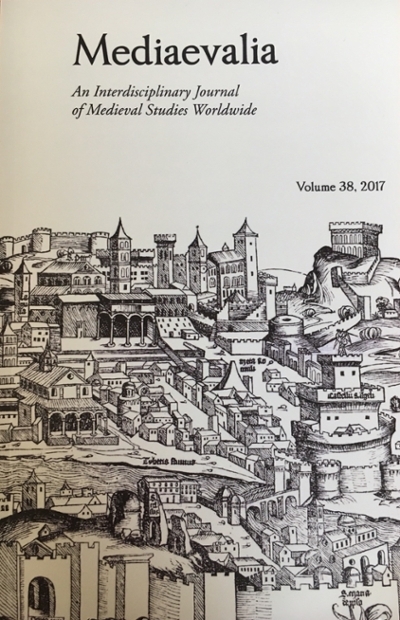 “Power and Right: Dante’s Monarchia and Two Documents of Juridical Literature from the XIII and Early XIV Centuries.” In Monarchia: Dante as a Political Theorist, edited and with and Introduction by Maria Luisa Ardizzone. Newcastle upon Tyne, UK: Cambridge Scholars, 2018, 1-25. “‘Liberi soggiacete’: amore e politica tra Purgatorio e Monarchia.” In Purgatorios. Purgatori, ed. Jorge Wiesse. Lima: Universidad del Pacífico, 2015, 261-291. “The Limits of Heterodoxy in Dante’s Monarchia.” In Dante and Heterodoxy: The Temptation of 13th Century Radical Thought, ed. Maria Luisa Ardizzone. Cambridge: Cambridge Scholars Publishing, 2014, 197-224. “Federico II e l’ambivalenza del sacro nella Commedia.” In Tra Amici: Studies in Honor of Giuseppe Mazzotta, eds. Walter Stephens, Theodore Cachey, Jr., Zygmunt Baranski, Teresa Kennedy. MLN 127.1 (January 2012), Italian Issue Supplement, S233-S244. “Amore, eresia e poesia. Concordanze cavalcantiane nella Commedia.” In Atti e Memorie dell’ Accademia Petrarca di Lettere, Arti e Scienze. ed. Giulio Firpo. Arezzo, 2008. “The Knot of Cavalcanti in the Commedia: A Few Threads.” In Guido Cavalcanti tra i suoi lettori, ed. Maria Luisa Ardizzone. Firenze: Casalini Cadmo, 2003, 221-245. “Poetry and Thought in Leopardi’s ‘L’infinito’.” Rivista di studi italiani 13.1 (June 1995), 67-87. 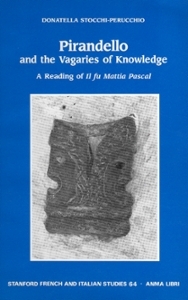 Pirandello and the Vagaries of Knowledge: A Reading of Il fu Mattia Pascal. Stanford French and Italian Studies. Saratoga, Ca. : ANMA Libri, 1991.